Mbira, doumbek, shakers, harmonium, saz, oud, and gongs draw you into flow and clarity. Mick Rossi is a celebrated pianist, composer, percussionist, conductor, and arranger. On Dancing Clouds, Mick blends light alpha waves pulses created by sound healer Dr. Jeffrey Thompson into vivid, evocative, and mellow layers of melody and rhythm performed on keyboards, mbira, doumbek, shakers, harmonium, strings, saz, oud, and gongs. A truly unique journey into tranquil musical spaces. Your body will enjoy the gentle rhythms while your mind is drawn into free flow and clarity. Light alpha waves are the brainwaves that people naturally produce in states of alert relaxation. 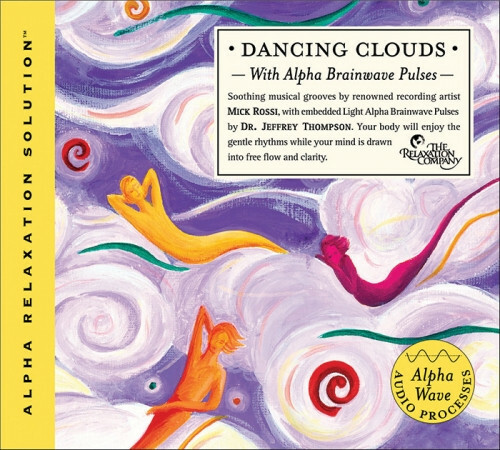 Dr. Thompson has developed unique ways to combine these light alpha pulses with musical soundtracks. After a few minutes of listening, your own brainwaves “lock” onto the pulses and lead you effortlessly to what is sometimes referred as “the zone,” where your body naturally relaxes and your mind rests in a place of centered calm, quiet focus, and sublime clarity. Mick Rossi—a member of the Philip Glass ensemble—has been heard with numerous artists including Kelly Clarkson, Roger Daltrey, Hall & Oates, Jewel, Randy Newman, Dave Douglas, Wadada Leo Smith, and Carly Simon. His Broadway credits include The Who’s "Tommy,” “Jekyll and Hyde,” and “The Full Monty,” among others. He has appeared on PBS, Lifetime, VH1, MTV, The Tonight Show with Jay Leno, and The Late Show with David Letterman.